Tullis Russell are a leading UK papermill based in Markinch, Scotland. 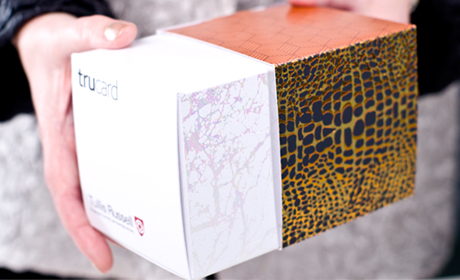 They supply Trucard cartonboard to major brands such as Swarovski, Bowmore Whisky and L’Oreal. Currently they supply around 15% of the cartonboard made in Europe. The Trucard Collection is distinguished by being the widest range of cartonboard available, comprising 17 different grades and finishes. Tullis Russell make all kinds of paper ranging from banknotes to stamps. 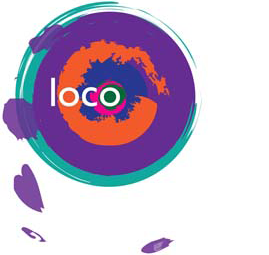 An employee-owned company they prioritise sustainable practices and are FSC certified. 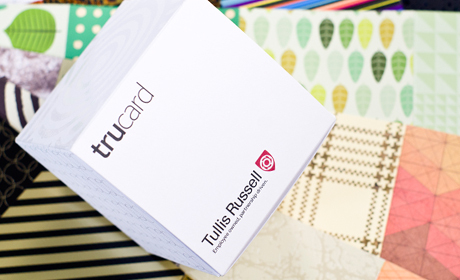 Tullis Russell seek to enhance awareness of the quality of their superb Trucard collection of cartonboard; its strength, consistency, choice of range and weights, stand-out and functional elegance in folding and cutting as well as service back up and product knowledge. In addition they wanted to reach brand owners via paper merchants, print production professionals, marketers and agencies. We created sleeves made from the Trucard Collection, each displaying a different finish and weight. Along with the sleeves, a ‘hero box’ was created over which the sleeves can be slipped to give an impression of how Trucard looks when made up into boxes. The print processes used on the sleeves are designed to test the exceptional capacities of the cartonboard. In nearly every case the styling of the sleeves obliquely evokes a retail sector. Themes such as bath and body, fashion, pharma, whisky are explored using texture, colour and finishes.